Researchers in Japan have developed a novel cyan-free electroless gold plating reaction providing excellent adhesion to various plastic materials. As photonics - using beams of light in place of electricity for communications and computing - becomes more common, engineers need new tools for troubleshooting. Now researchers at Cornell have created a way to plot the waveform of an ultrashort-lived optical signal with a resolution of less than a trillionth of a second. Highly magnetic nanoparticles, originally devised for biomedical purposes, soon will be tested against one of the most toxic substances known to man - spent nuclear fuel. The latest quick freezing techniques coupled with sophisticated scanning electron microscopy techniques, are allowing physicists to create ice films in cold conditions similar to outer space and observe the detailed molecular organisation, yielding clues to fundamental questions including possibly the origin of life. A new configurable chip which can correct faults in newly- manufactured transistors and can be implemented in mainstream devices such as mobile phones and computers, has been developed by engineers at the University of Southampton. Scientists in Canada are reporting progress toward a new type of 'liquid mirror' - mirrors made with highly reflective liquids - whose shape can be changed to provide superior optical properties over conventional solid mirrors. Among Jonnalagadda's innovative activities will be nanotechnology strategy development in collaboration with the national laboratories Battelle manages or co-manages. 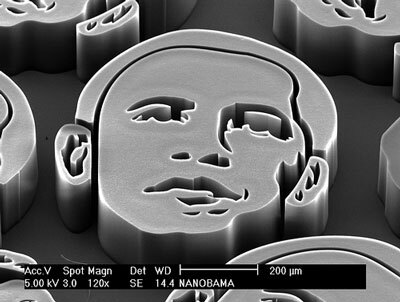 University of Michigan professor John Hart has made faces of Barack Obama using nanotechnology, specifically carbon nanotubes, and imaged them using a scanning electron microscope. Researchers at Rensselaer Polytechnic Institute have developed a measurement technique that will help scientists and companies map nanomaterials as they grow. 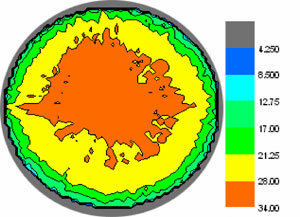 Dutch-sponsored researcher Robin Gremaud has shown that an alloy of the metals magnesium, titanium and nickel is excellent at absorbing hydrogen. This light alloy brings us a step closer to the everyday use of hydrogen as a source of fuel for powering vehicles. 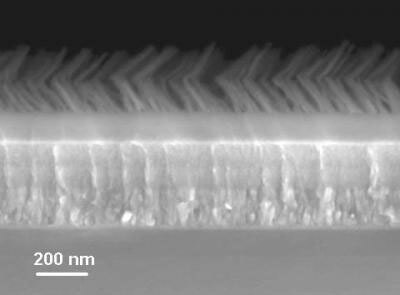 The Instituto Madrileno de Estudios Avanzados en Nanociencia (IMDEA Nanoscience) collaborates together with the University of Hamburg in the development of composite materials based on semiconductor nanoparticles and carbon nanotubes as functional materials for efficient light emitting diodes and photovoltaic devices. Thomas H. Epps III, University of Delaware assistant professor of chemical engineering, and Erik Thostenson, assistant professor of mechanical engineering, are among just 39 scientists and engineers throughout the country selected to receive three-year research grants from the U.S. Air Force Office of Scientific Research (AFOSR) Young Investigator Research Program. 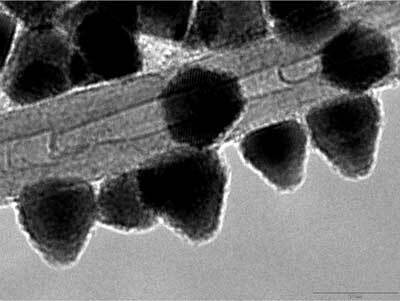 By perfecting a technique to control the vibrations of high frequency nano-cantilevers, Canadian physicists have overcome a roadblock to using nano-electro-mechanical systems (NEMS) for digital logic and memory applications and have, taken the first sub-nanosecond mechanical measurements of NEMS.